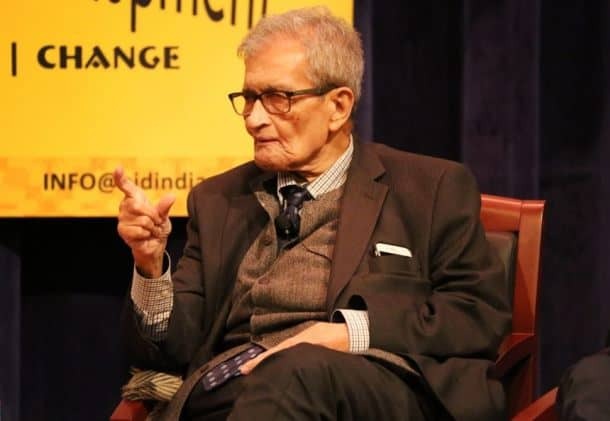 Professor Amartya Sen returns to India again and again from his residency in Harvard where he is Thomas W Lamont University Professor for his academic work. But he also uses the time to see which way the country is moving politically, economically and socially and he is fearless in letting the world know his views. 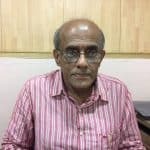 The Nobel laureate, who is intensely disliked by the Modi government, described demonetisation of two high value currencies as “despotic action that has struck at the root of the economy based on trust.” As the Reserve Bank of India finished counting the demonetised notes that were returned to banks, Professor Sen stood vindicated and his bête noire Professor Jagdish Bhagwati must be regretting his unwarranted criticism of a fellow economist. More recently, Sen had a jibe at the present regime when he said that “things have gone pretty badly wrong… It has taken a quantum jump in the wrong direction since 2014. We are getting backwards in the fastest growing economy.” The backward movement has made India the second worst in the region. “Pakistan has managed to shield us from the worst,” said Sen who is pained by the government’s indifference to issues of inequalities, caste system, universal healthcare and education. Sen is a source of discomfort for the government for what he says finds immediate global currency. In the past it was inconceivable that elections in India could be won on Hindutva platform. But times changed and 2014 proved to be the watershed when using the religion card unabashedly BJP claimed 31 per cent of votes to win 282 seats in the 545 strong Lok Sabha. Sen argues that since this has happened, it is imperative that opposition parties unite to take on BJP in the parliamentary elections to be held next year. The battle is not of one entity against the other or Narendra Modi against Rahul Gandhi. The issue concerns what India is. In the kind of camaraderie in display of late between Akhilesh Jadav of Samajwadi Party and Mayawati of Bahujan Samaj Party and their success in Uttar Pradesh by-polls and the recent display of political skills by Rahul Gandhi are giving hopes to Sen that opposition unity is possible. In a long interview with Kolkata’s leading Bengali newspaper Anandabazar Patrika, Sen says it is not politically desirable that opposition parties should combine only to win elections. He would expect the parties thinking of combining forces to take on the might of BJP not to be overwhelmed by the leadership issue. To avoid the pitfalls of a leadership race, the parties should be principle driven. Unfortunately, a situation has come when people tend to feel shy to say that they are doing principle based politics, for the fear of being seen divorced from reality. Explaining why it is so, Sen told Anandabazar that the perception of unity that was there in India had come under a major attack, principally from BJP. As a consequence, many had come to believe that in reality Indian unity was nothing but a myth and it was amateurish to think and discuss the subject. Sen is firm in his belief that unless the opposition parties remain deeply concerned about the attack on Indian unity, their coming together for contesting the elections alone will not herald a forceful political agitation. Mercifully, it is not that some in the opposition are not doing serious thinking about the issue. Sen mentions in this regard Kanhaiya Kumar and his fellow students in JNU, Jignesh Mevani who came into limelight during Gujarat elections and also Akhilesh and Tejashwi Yadav of RJD. Sen wants the countrymen to be aware of the real character of India. They must be resolute in their determination that they will not allow deviation from Indian unity. However much we may talk about the concept of unity, people are concerned about the absence of democracy and assertion of autocracy. In a sharp reminder to political parties, Sen says in the formulation of a strategy, they must consider how much the prevalence of autocracy is bothering the people. Citing the example of West Bengal where Trinamool Congress trounced the CPI (M) in Assembly elections first in 2011 and then again in 2016, Sen says like its predecessor the Left Front in government, Trinamool is using force, albeit in a bigger way to subjugate people. But dialectics ensures that as by way of subjugation the oppressor increases her power, the people’s resolution to resist that hardens simultaneously, he says. Sen says that the people he spoke to believe their sympathy for BJP is not because of their liking of the party, but it is essential to stop Trinamool oppression which CPI (M) in the opposition is totally incapable of doing. Elaborating the point he says even while people strongly abhor communalism, they may at some point consider it important to combat autocracy. Like use BJP to remove Trinamool from power. The communalism issue related to BJP could be dealt with afterwards. People of Bengal may be thinking that the kind of politics BJP practises could not be the politics of Bengalis. Reminding the people of BJP’s success in spreading its influence in large parts of the country, Sen says it has become essential to have a serious political discussion to stop the party’s march forward. The time has come when political discourse on what BJP actually is, what kind of political philosophy it espouses and how it continues to spread its influence needs to be backed by political activism. Is it of concern to Sen that the champions of Hindutva have been able to implant in the psyche of many of a different kind of Indian unity? He says such people are proclaiming that Hindutva is a big umbrella under which many could come. To buttress the point they are quoting from Vivekananda, but absolutely wrongly. Sen does not believe everyone in BJP accepts the big umbrella idea. Many in that party have sectarian ideas. At the same time, wherever it will be of help, they will sell the big umbrella idea. They are precisely doing that in West Bengal, says Sen.